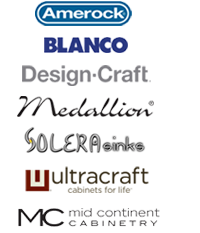 A Multi National Award Winning Residential Design Company and Cabinet Dealer in Escondido specializing in kitchen and bath re-models, built-ins, home offices, laundry rooms, fireplace surrounds and more. Cabinets By Design is committed to the highest level of customer service and quality of workmanship no matter how large or small your project or budget is. They pay attention to the smallest details. 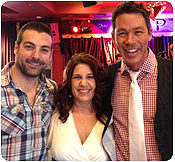 It’s no surprise that they built and expanded the business through the recession based strictly on referrals. Your project could not be in better hands. Opened in 2005, Cabinets By Design are certified designers and have won numerous Design Awards for their work. Browse some of the beautiful bathroom remodels we have completed for previous customers in the San Diego area. We specialize in helping you find the right kitchen remodeling solution for your family’s lifestyle and budget. By making an appointment, we can make sure you get the attention you deserve when you visit our showroom. After graduating from the Culinary Institute of America in 1980, Sandra moved to California and worked as a private chef to the rich and famous for many years before deciding to become a Kitchen & Bath Designer. 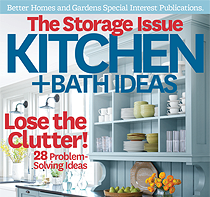 We are very proud to be featured in the 2014 Winter Edition of Better Homes & Gardens - "The Storage Issue Kitchen + Bath Ideas."